This Helichrysum oil #118 is from our trusted supplier in Bosnia and Herzegowina of many years. The image is from one of the actual hillsides where the Helichrysum is collected. It illustrates how the plant occurs in the wild and how tedious the harvesting must be. Everlast or Helichrysum italicum is the active ingredient in many high priced skin care products. Its cell regenerating qualities benefit the skin and liver and actually the whole person. It is used for healing of even old scars and cheloids as well as preventive and curative wrinkle treatments. As the quantities of Corsican oil have dwindled, prices for oils from Bosnia and Herzegovina have been pushed upwards by large corporate buyers. As far as therapeutic efficacy goes the Bosnian oils are at least as effective as the Corsican distillates. While there may be therapists who have developed a special relationship with the Corsican oil and hence have their best results with this variety the Bosnian oils have a higher diketone content and are especially suitable for wound and scar healing. Diketones are the components largely responsible for the antioxidant and tissue protective qualities of Helichrysum italicum essential oil. 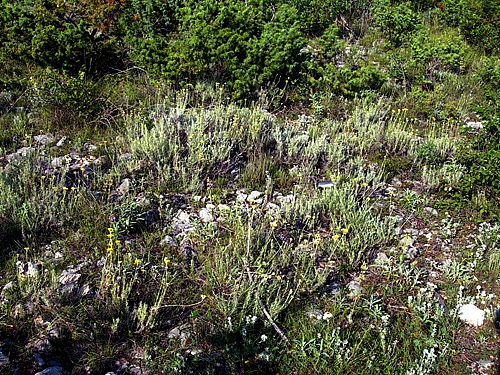 The above image shows a cluster of wild Helichrysum plants on a typical Bosnian hillside. In early summer there are collectors everywhere on these hillsides, mostly cutting the wild plants for the large corporate buyers. It is consoling that there is more and more successful cultivation of Helichrysum in Bosnia and Herzegovina, ultimately easing the pressure on the wild plants. Won't buy Helichrysum from anyone else! This Helichrysum is beautiful affordable! I use it on on everything from bumps and bruises to pain and inflammation blends. I always get a good result from this oil. Outstanding Healing properties and love the scent! I LOVE this new batch Everlasting #118! Great results on common skin lesions, complexion and on the family dogs dermatitis. Wonderful fragrance!